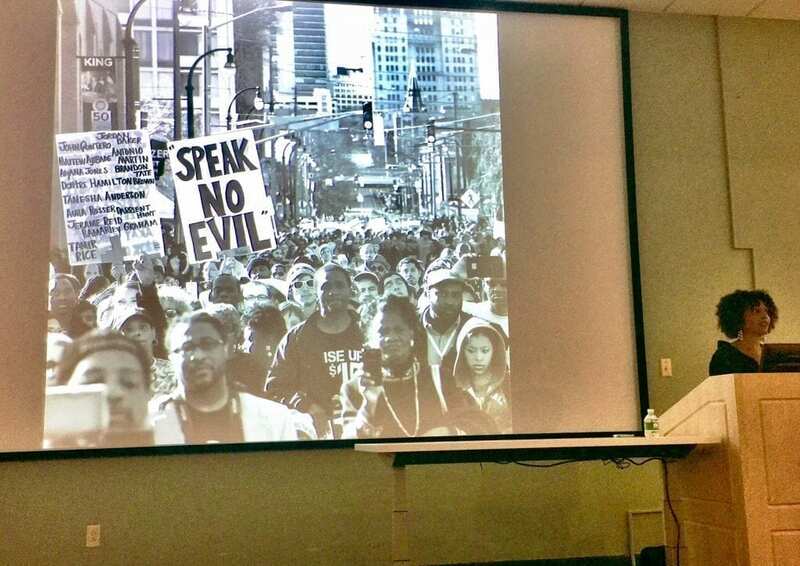 A week after investigative journalist Nikole Hannah-Jones discussed modern segregation through print storytelling at the University of Tennessee Howard Baker Center, photographic artist and social activist Sheila Pree Bright showed a similar idea through images in McClung Museum Thursday, Sept. 13. The deaths of young black men like Treyvon Martin and Michael Brown, which prompted protests and rallies around the country, compelled Bright to focus her work on the modern civil rights movement. “I myself wanted to go to the ground to find what was going on,” Bright said. Bright well knew struggles faced during the prior civil rights movement of the 1950s and 1960s. Bright’s father joined the military to escape punishment for his opinionated rhetoric during that era. “Either he was going to be lynched, or he was going to be put in jail, “Bright said. Bright traveled across the country taking photos of marches in Atlanta, Baltimore, Washington, D.C. and Ferguson, Missouri. Bright hopes her raw images will change an often misconstrued narrative of violence in the Black Lives Matter movement and beyond. Bright realized the power of images in an increasingly visual society. In the 1960s, television news coverage of police brutality and segregation prompted people of all races to travel around the South on freedom rides challenging Jim Crow law. Bright sees parallels on digital avenues today as social media connects young people through hashtags promoting change. “In order for this country to change, I feel that young people are always the ones globally, the ones to make a stand, to make a change,” Bright said. Bright called the inequalities people fight today the “perpetual revolution.” But she believes young adults have the power to change momentum––to end a revolution past its expiration date. Bright’s husband, Jeryl Bright, agreed with his wife. Bright’s collection 1960Now will be published as a book Oct. 16. The publication comes in conjunction with a traveling exhibit, which Bright said will find its way to college campuses to engage young people. The next and final speaker will be UC Santa Cruz sociology professor Herman Gray on Oct. 18 from 5:30 to 7:00 p.m. The exhibit remains on display until Oct. 20. Previous POLL: Week #3: Who will win?